Knoxville does not have a Container Store, but that does not mean the city lacks the hottest organizing products. Robin and Travis Carbaugh have ownedSpaceMakers The Get Organzied Store since 1997. Located in the shopping meca of West Knoxville’s Turkey Creek, SpaceMakers is across from Walmart. 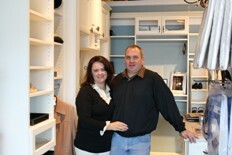 On my visit this week, Robin and Travis walked me through the newly remodeled showroom. Besides featuring numerous organizing products for all areas of the home and office,SpaceMakers offers custom design services for closets, garages, office, and pantries. They offer both custom melamine and wood veneer systems from basic to designs featuring crown molding and unique drawer inserts. They also offer Do-It-Yourself products for those inspired by HGTV, also located in Knoxville. Their website is expanding and online shopping is available for many items. If you are in East Tennessee, SpaceMakers a must stop for your holiday organizing needs and Get Organized Month projects in January. Besides, organizing a garage is much more fun with snow falling than during hot and humid days of summer! This entry was posted in Clutter Free, Custom Closet, Home Organizing and tagged Chris McKenry, closet design, clutter, Container Store, DIY, Do-It-Yourself, Get It Together LA!, HGTV, holiday organizing, Knoxville, mckenry, Organize, SpaceMakers, Walmart on October 6, 2011 by Chris McKenry.